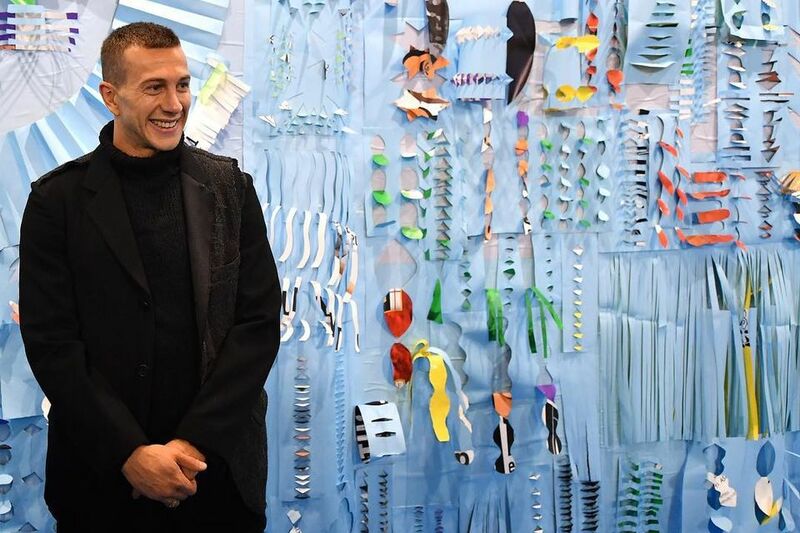 What is a football club doing at an art fair? Football has been used as a subject by artists for centuries, but beyond the canvas, the two worlds seem like uneasy bedfellows. On the one hand, you have the world’s most popular sport, the biggest entertainment spectacle on earth, and on the other you have the restrained, niche appeal of art. It’s a high culture vs low culture clash if ever there was one. So quite what Juventus F.C. was doing sponsoring the kids section of the Turinese art fair Artissima (2-4 November) is something of a conundrum. One large booth in the corner of Artissima, sponsored by Juventus, was taken over by the Argentinian artist Alek O. She filled the space with cushions and reams of used Juventus posters. Children could join workshops to learn to cut and collage the posters into new shapes and designs. 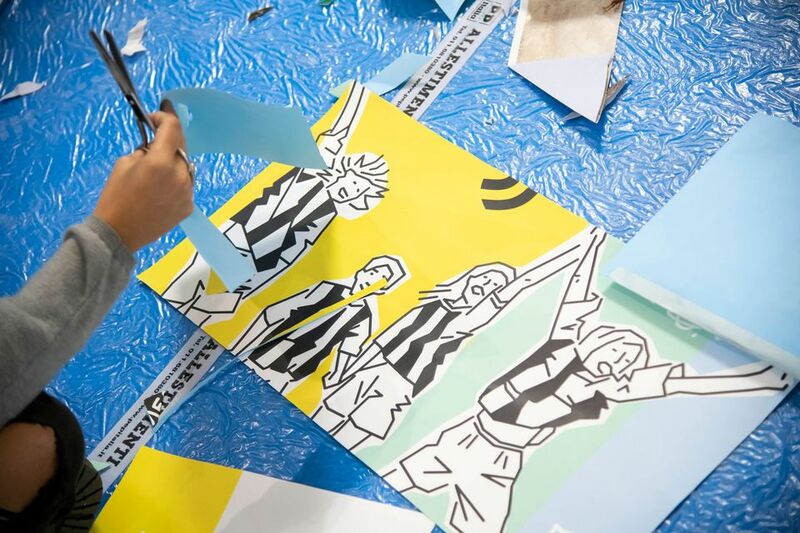 At one point, even Juventus players including the brilliant young winger Federico Bernardeschi showed up to pitch in with some collaging of their own. But the question is why. It was Artissima director Ilaria Bonacossa’s idea to get Juventus involved in the fair. "A year ago, I was in Milan and I saw that Juventus had done a design project called U Joints, and I thought since we, like them, are from Torino we should do a project together. We talked, and they were interested in using art to develop new audiences, to cater to women and children etc," Bonacossa says. It makes sense: Juventus isn’t just Turin’s most famous export, it’s also Italy’s biggest football team. "Juventus represents an international Torino, which is what Artissima tries to do too." The objective for Artissima is simple: "Having Juventus here caters to an idea that art isn’t snobby. It opens it out." So the art fair gets sponsorship money from an unlikely source and the chance to attract a new audience. Simple. But what is Juventus getting out of the deal? The answer may lie in its ambitious choice to splurge $110m on the ageing football superstar Cristiano Ronaldo this summer and their recent brand redesign, ditching their iconic badge for something a little sleeker. "We’ve changed our identity from a sport emblem to a brand logo because unfortunately our domestic industry is not at the same level as our peers like the Premier League," says Luca Adornato, Juventus’s Brand Development Manager. "In order to compete in the world sport arena, we decided to move in a new direction. We wanted to convey our values without seeming like just a football team. Of course playing football is our core business, but in order to compete we have to have Ronaldo and other big players, and in order to do that we have to grow our business, so we have to be relevant to a wider audience. We decided to be distinctive." Partnering with an art fair is distinctive, sure, but can appealing to the few thousand people who traipsed around Artissima’s booths really be that important to the mega-brand? Of course not, those sorts of figures are loose change to them. "This is a first step, and now we’re evaluating how to build up a more consistent path in terms of where to focus to increase our reach and how to increase our credibility," Adornato says. And that’s the clincher. What Juventus gets by being associated with an art fair is something the art world is uniquely placed to offer: credibility. Will we see Manchester City holding exhibition games at ArtBasel? Chelsea flogging shirts at Frieze? If credibility is what’s on sale in exchange, don’t bet against it.